This book provides tips on how to improve your quality of life and performance, and how to stay healthy and productive by recognizing and correcting biochemical disorders at an early stage. SKU: 9781782550556. Category: Sports Business. Tags: Business, Elmar Wienecke, sports. Top Performance in Business and Sports offers direction that will help you operate at your best in both business and sports. More and more people nowadays feel stressed out. In many cases this even leads to burnout. They feel empty, they cannot go on anymore, they are without motivation, power and joy. Over the past ten years, the number of people suffering from this state of exhaustion has quintupled in Germany and more than one third of the work force feels that way. In addition, 79% of them show signs of stress and are unable to relax after hours. A similar situation can be seen in sports: The athletes dream of winning titles, they need success as a means of approval of personal strength. 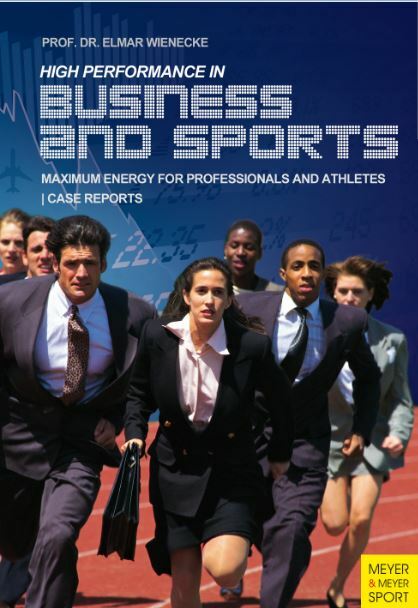 In addition, high-performance in business and sports has become much more financially lucrative. All of this has led to rising mental and physical demands. Due to this, athletes experience more exhaustion, extreme performance fluctuations, mood swings and often inexplicable injuries. Top Performance in Business and Sports provides tips on how to improve your quality of life and performance, and how to stay healthy and productive by recognizing and correcting biochemical disorders at an early stage. Professor Dr. Elmar Wienecke is a P.E. teacher and sports scientist. He received his doctorate from the German Sport University Cologne in the faculty for sports medicine/cardiology/training theory and kinetics. His own negative experience in sports led to an early invalidity. After that, he started his career as a soccer coach. In 1989, he received the training license for the Bundesliga. He ended his work as a soccer coach with 33 years and founded SALUTO, the internationally acclaimed center of excellence for health and fitness in Germany. SALUTO is a combination of medical services, diagnostics, science and research. How can nations improve their chances of winning medals in international sport? Successful Elite Sport Policies informs the reader about the strategic policy planning process that underpins the development of successful national elite sport development systems. Drawing on various international competitiveness studies, it examines how nations develop and implement policies that are based on the critical success factors that may lead to competitive advantage in world sport. Howard Tullman has successfully founded more than a dozen high-tech businesses in his fifty year career and created more than $1 billion in investor value as well as thousands of new jobs. Growing a Startup in the Digital Age gives solid advice on growing your startup. Growing a Startup in the Digital Age is a collection of Tullman’s straight forward, plain-spoken principles which are crucial to the successful growth and expansion of a new start-up today in almost any technology- driven marketplace.